Emarketer, a leading research and analysis firm, has revealed that the world will have 2 billion smartphone users by 2016. India will be a leading catalyst in this tremendous technological push, as it will overtake USA to become world’s second largest smartphone market with 200 million+ users. With 500 million users in 2014, China is the world’s biggest smartphone market. By 2016, 624.7 million Chinese would be using a smartphone. The research was conducted after analyzing and studying smartphone user forecast and current trends of 41 countries including Middle East, Africa and Asia. The report mentions that by 2017, 65% of all Americans will be using a smartphone and by 2018, Indonesia will have 100 million consumers of smartphone, and will be ranked 4th. By the time 2015 ends, Russia will overtake Japan to become 4th largest smartphone user base. Here is the ranking of top 25 countries as per smartphone adaption and usage for the period 2013-18. Using quantitative and qualitative data from research agencies, Government forecasts and combining them with worldwide and local trends in population, Emarketer was able to derive these numbers. 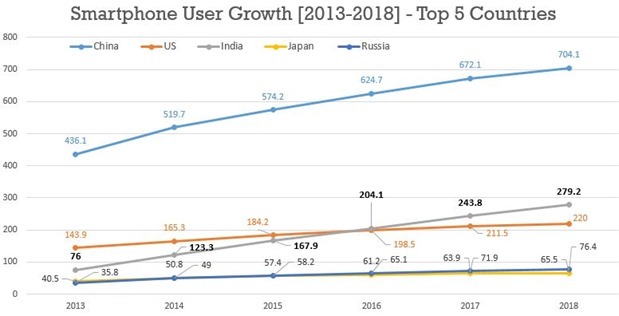 In 2013, the world hit the 1 billion smartphone user mark, with China leading the way with 436 million users and India with 76 million smartphone users. Earlier this month, we had reported that India is witnessing fastest growth of smartphone users in Asia-Pacific with 27% quarterly growth. This research by Emarketer is perfectly synchronizing with this data. You can find the complete report here. 200 million or 20 crore smartphone users in India by 2016 signals a brave new world for the mobile and digital entrepreneurs from India. Imagine 20 crore Indians empowered with a device which connects with Internet – a plethora of opportunities stare us right now. Besides the never-ending hunger for content and entertainment, there would arise a huge need for services and maintenance as well. If we consider Internet and add this factor into the whole puzzle of smartphone adaption, then the possibilities expand into infinity. How can Indian entrepreneurs tap this tremendous opportunity which is being thrown at them? Do share your views by commenting right here! "204M Smartphone Users In India By 2016. Will Surpass US: EMarketer", 5 out of 5 based on 1 ratings. Are Women’s Safety Apps Really Useful? Micromax Vs Samsung: Is Micromax on Shaky Ground?